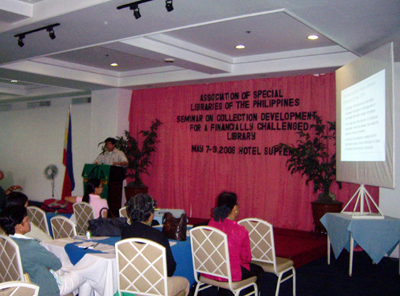 The Association of Special Libraries of the Philippines held a three-day seminar with the theme “Collection Development for a Financially Challenged Library” last May 7-9, 2008 at Hotel Supreme, Baguio City. 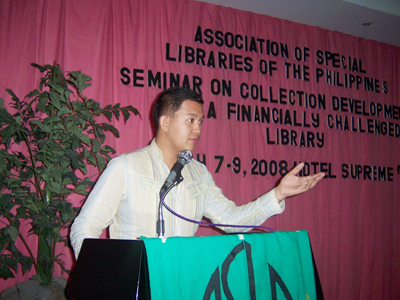 The seminar aims to provide librarians with knowledge on new techniques and strategies for acquiring library resources, approaches for augmenting the resources, and how to become more responsive to the needs of the library. EISI which has been helping librarians in leveraging the use of technology, once again came as an exhibitor to further establish professional relationship with librarians and to promote Destiny, Follett’s newest product. EISI booth at ASLP manned by EISI personnel. Shown above are Axel Cabarles (Sales Supervisor) and Engr. Snooky Ignacio (Luzon-Sales Engineer). 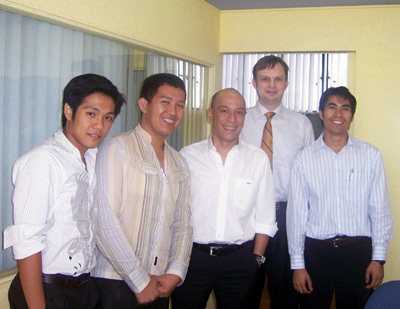 It was a pleasure meeting Tim Ramsey, Vice President for International Sales- Asia Pacific Region of Follett International last 23 April 2008 in Makati City. Mr. Ramsey personally came to introduce and promote Destiny Resource Management Solution, Follett’s newest product. 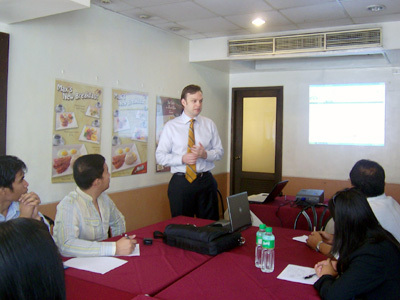 EISI took advantage of Mr. Ramsey’s visit by bringing him to some of our valued Follett clients and soon-to-be clients in Metro Manila. 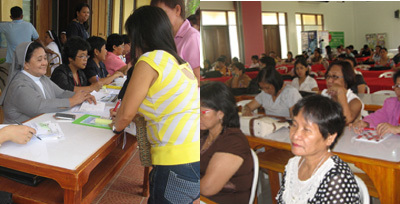 During the site visit, our clients got their first total hands-on experience with Destiny. 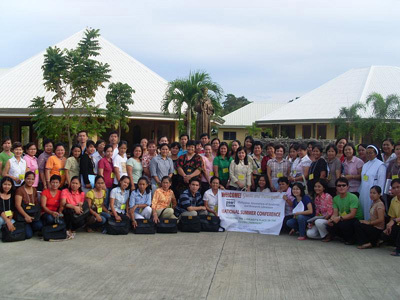 The group got a warm welcome from a Follett user, Ms Rhona Bautista, Chief Librarian of the Union Church of Manila (UCM). The team also took their chance to visit other schools nearest and available in the area. Destiny is a totally web-based library automation and educational asset management software for consortia and multiple campuses. 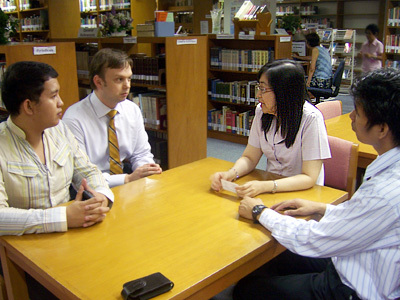 It centrally manages library materials, textbooks, instructional media and fixed and portable assets Campuses using all Destiny solutions simultaneously benefit from consolidated reporting and seamless sharing of patron data across all modules. Destiny is now being used by many schools in United States as well as in other parts of the world. 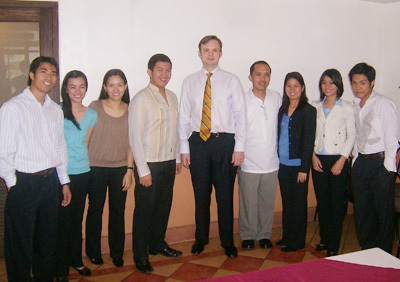 Visit http://www.eisi.com.ph/promo/ for further information. With Destiny, access to library information is fast and easy. No matter how far, no matter where you are…it’s just one click away! 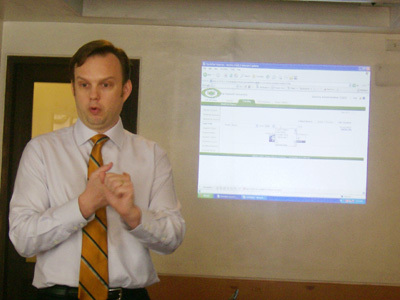 Tim Ramsey, VP for International Sales- Asia Pacific Region of Follett International, proudly presents Destiny to EISI Staff to learn more about Follett’s newest product. 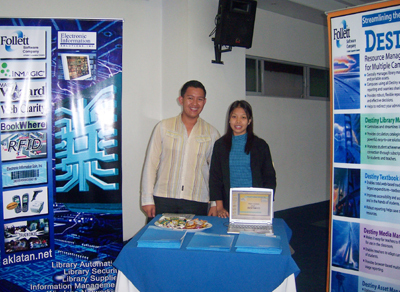 EISI once again came as one of five exhibitors and was chosen to present one of our company’s newest product, Destiny (A Totally Web-Based Library Automation and Educational Asset Management Software for Consortia and Multiple Campuses) on the Philippine Association of Academic and Research Librarians (PAARL) National Summer Conference at St. Ezekiel Moreno Spirituality and Development Center, San Jose, Puerto Princesa City, Palawan last April 23 to 25, 2008 with the theme “Finding the Library’s Place in the 2.0 Environment: providing for interactive, collaborative, and multi-media web-based technologies services and resources”. 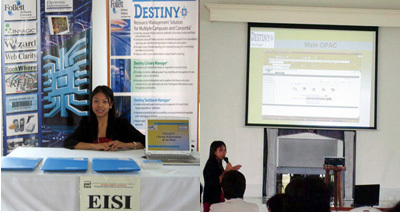 The EISI Booth (left) with Luzon Sales Engineer Ms. Snooky Ignacio presenting Destiny, a new product from Follett (right).